The secret behind every great website is a top-notch design. You could have a memorable domain name, set up promotion campaigns to direct traffic to your website, and have an awesome product or service to offer, but if your website doesn’t have an intuitive and appealing design then visitors will bounce from your page as quickly as they arrived. Designing your website with a minimalistic approach boils down to keeping your website uncluttered and simple. This is especially important on your homepage, where you’ll want to space out images and text to keep an even and organized feel that guides your site’s visitors to the different subpages you want them to click on. For a great example of minimalistic homepage design, check out Milk.xyz’s homepage below. When you design your website with a minimalist style, that doesn’t mean you need to cut out having text. Wherever you do plan on putting content, though, just make sure the paragraphs aren’t too long or filled with difficult language and jargon. Accessibility is key to getting visitors to stay on your page, and a welcoming website design is one that uses short paragraphs of text with concise sentences. 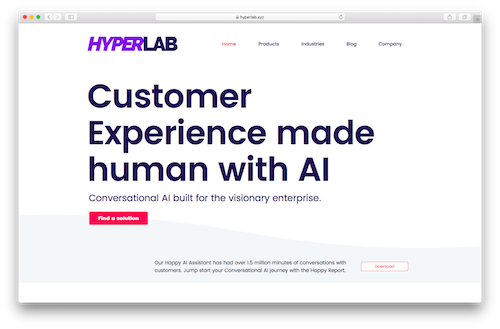 For inspiration on the right way to design text on your website, check out how Hyperlab.xyz does it below. We’ve talked about the importance of designing your site using “Mobile first” in the past, but it bears repeating here. Odds are the majority of your website’s visitors will be accessing your page via a mobile device, so designing your website to look appealing on a mobile device first, then scaling the design up to look great on desktop is the best way to ensure your site keeps visitors no matter where they’re accessing your page from. Supernova.xyz is a great example of the kind of beautiful look you can get by designing your website with mobile first. When you design your website, imagine it’s like a map. You are drawing the lines of the streets and where they lead, but the user is the one driving the car. Set up eye-catching call-to-action (CTA) buttons leading to important subpages, and use text placement along with enticing, clickable images that lead visitors to the information you want them to see or the pages you want them to dig deeper into. One great example of a well-mapped site is MIT’s Engine.xyz. Adding the personal touch of your brand, your idea, or even you yourself when you design your website will endear visitors to the content you’re displaying and make them more interested in engaging with what you’re showing them. 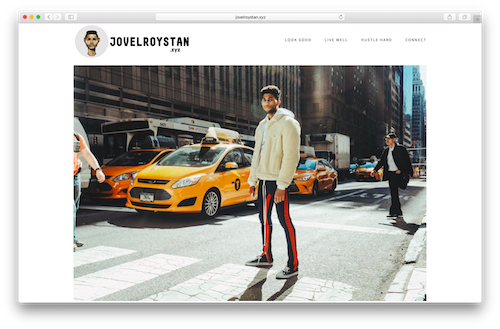 For ideas on how to design your website with a unique personal touch, check out JovelRoystan.xyz. You’re going to be putting serious effort and time into designing your website. Make sure it’s worth your while and take full advantage of tracking tools like Google Analytics to see where your site traffic is coming from, which pages visitors stay on the longest, and what pages users navigate to and from the most. This will help you identify what is working on your site, and let you see exactly what tweaks need to be made to get the most from every visitor to your website. These tips will help you design a website that not only looks fantastic, but works to get you the results you want. Now that you’re ready to design a beautiful website, don’t miss your chance to submit it in XYZ’s website design contest where you could win an iPad Pro! All the details on how to win can be found at www.gen.xyz/giveaway, and the contest is running from now until July 31st. Get your .xyz domain and get started on building your winning site today at www.gen.xyz/register. Enter your .xyz site to win an iPad Pro! Did you know that nearly half of all households in the world have a computer? 87% of US households alone have one. With that kind of widespread adoption, it’s not surprising to see that there are a lot of computer and internet users who don’t have a strong grasp of everything the powerful machine in their living room can do. But no matter your PC proficiency, there are coders out there who have your back. This week we’re taking a look at one in particular who has created a tool that helps businesses avoid getting stuck using confusing tech to build their software: Code.xyz. Code.xyz was created by Keith Horwood as a property under his company StdLib which provides software developers with tooling to effortlessly build APIs, or “the building blocks of modern business software” as Keith frames them. 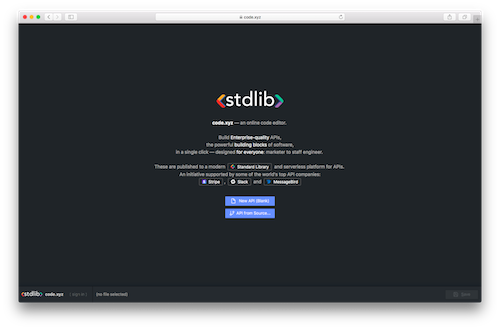 This innovative platform and approach to API building caught the attention of major Silicon Valley investors Stripe, who committed $2 million to back Code.xyz and help it grow to acquire legions of developers. “The overarching goal of Code.xyz is to provide a “Google Docs”-like experience for people writing web-based software and business integrations (APIs). Software development is still very much a highly technical field, but that’s rapidly changing. #GenXYZ is filled with intelligent individuals, and it’s inspiring when we see that intuition being used to help make a solution that simplifies the lives of others. Code.xyz is making things easier for developers everywhere, and is a perfect example of the good you can bring to your industry when you apply your knowledge to make things better than you found them. Watch the #XYZsquad bring the excitement to E3 2018! If there’s one thing we know #GenXYZ loves, it’s video games! So the team from XYZ headed across town to the LA Convention Center for E3 2018. This is the first time E3 has been opened to the public, and the tens of thousands of gamers in attendance enjoyed getting down with the #XYZsquad in between playing demos of all the biggest upcoming game releases. Check out the full video recap of our trip to E3 below! Throughout our #WebsiteWednesday series we’ve highlighted #GenXYZ members from many industries who have embraced .xyz as their domain of choice. The design community, though, has developed a special attachment to .xyz. It has brought us some of our most inspiring users, like influential fashion designers PublicSpace.xyz and Goetze.xyz, prolific graphic designer SoaLee.xyz, and award winning design firm Vierkant.xyz, to name just a few. This week, we’re heading back into the world of design to look at an architecture firm that has received worldwide acclaim and an award from the World Architecture Festival; EdgeArchitects.xyz. Since 2004, EdgeArch has been a leading international architecture practice that takes advantage of its global network of engineers, project managers, architects, and consultants to create beautiful and sustainable structures. EdgeArch has designed and engineered everything from major airports and hospitals to university buildings and diplomatic missions, and their work has risen to be recognized internationally, including garnering two nominations in the 2017 World Architecture Festival awards. EdgeArch won the category of “Future – Civic” for their design of the Saudi Consulate Building in Karachi, Pakistan. 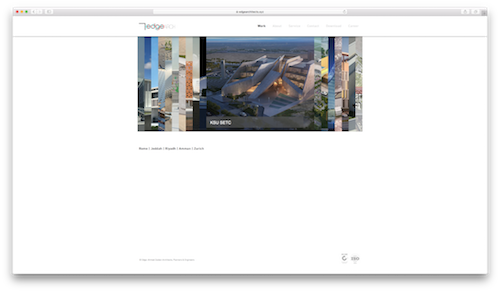 In 2016, EdgeArch took the next step in bringing their brand to a global audience and announced the launch of their new home online, EdgeArchitects.xyz. The domain is a perfect fit for the firm; a world renowned and award winning architecture company deserves no less than the ability to brand on a memorable domain name using the world’s most popular new extension, .xyz. EdgeArchitects.xyz are backed by experience, have proven their exceptional work time and time again, and are trusted with taking on the most important projects Saudi Arabia has to offer. With their .xyz domain they’re poised to not only continue thriving in their local market, but to expand their reach and influence and bring their genius to clients around the world. Retail is one of the world’s oldest and largest industries, but with the dawn of e-commerce and the meteoric rise of social media use, retail is getting a big makeover in the 21st century. Want to know how to launch a retail brand that is positioned to harness these new technologies to take the market by storm? Then look no further than the work of this week’s #WebsiteWednesday, Supernova.xyz. Supernova.xyz, founded by serial investor and entrepreneur Emily Hamilton, is a brand management company which has designed and launched 4 unique and highly successful retail products: fitness and nutrition program ‘bodyboss’, weight loss solution ‘SkinnyMint’, skin care system ‘Sand & Sky’, and hair nourishment lotion ‘Coco & Eve’. Supernova has pushed these brands to staggeringly impressive levels of social influence, including garnering a total of over 70 million views across their social media channels and amassing an audience of over 2 million women reached via social media per day. 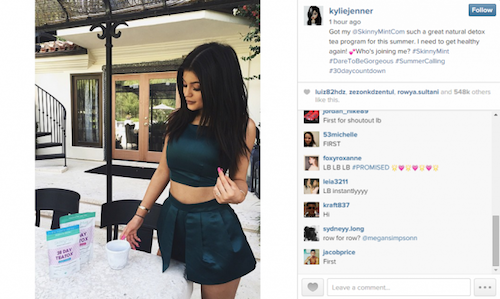 Even social media queen Kylie Jenner is a believer in Supernova.xyz’s products. So, how does Supernova boost their direct-to-consumer brands to such high levels of social influence and commercial success? It’s all in their systematic approach, which maps out product development, branding and packaging, social media marketing, an e-commerce storefront, international shipping, and customer service to ensure the highest level of consumer satisfaction. 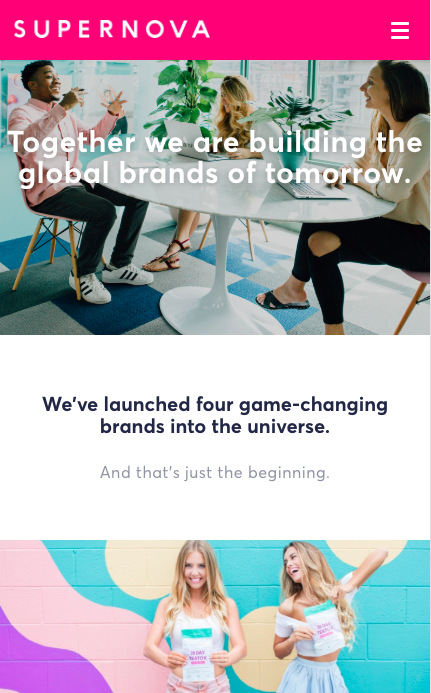 This synchronization of product development and brand messaging gives each of Supernova.xyz’s products a relatable identity, paired with high product accessibility. 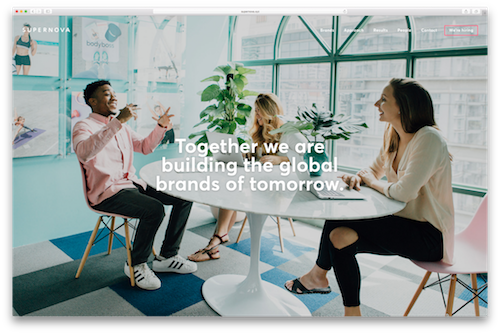 “The inspiration for Supernova.xyz was to combine innovative product development and social media marketing to create and build digitally native brands. We aim to grow our existing brand portfolio to expand the products on offer and the markets we reach. Plus we are incubating more brands to expand the brand portfolio to cover more beauty, fitness and health brands. As members of Generations X, Y and Z, we live in a world with easy access to technology that is vitally connected by social media networks. This means that, with the right strategy, we have a truly unique opportunity to develop products we believe in and grow them into global brands. Supernova.xyz is a perfect example of how #GenXYZ is seizing this moment in history, and serves as proof to every young entrepreneur that their dreams of bringing their idea to millions can be a reality. So, you have a great idea. You’ve gotten your .xyz site, and you’re all ready to bring your business online and grab your share of the market. But, you find marketing is a slog and getting traction for your business is a huge challenge. For startups this is a familiar nightmare, which is why this week’s #WebsiteWednesday, GrowthEngine.xyz, is here to help them acquire users, generate traffic, and grow their business. GrowthEngine.xyz is a growth marketing agency whose team combines their depth of experience, proven marketing methods, and a data-based approach to target high potential opportunities for a business to grow its user base and, subsequently, its market share. 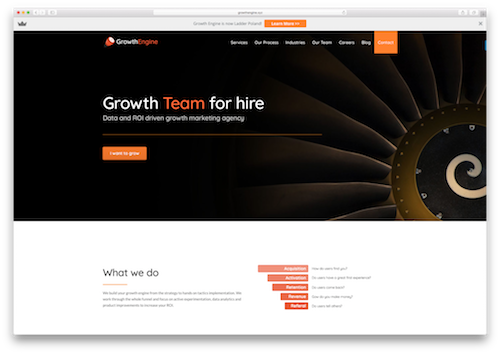 GrowthEngine was founded by Adam Weselowski, a former Google employee and marketing expert, and Tomek Duda, an experienced marketer with a background in analytics and technical marketing. Together with their team of analysts and strategists, they will help your business gain traffic and customers by taking it through 3 phases; 1) an audit of your data and target market to determine the path you’ll take together, 2) implementation of analytical tools that will help your business grow, and 3) ‘High tempo testing’, which tracks users and channels to draw valuable insights. Once you’re armed with this in depth breakdown on your target market, you’ll be ready to grab all the “low-hanging fruit” and build your market with a sizable new, and solid, user base. Having a truly innovative idea is at the heart of all great businesses, and all it takes is a well laid out marketing plan to help that idea reach its full potential. 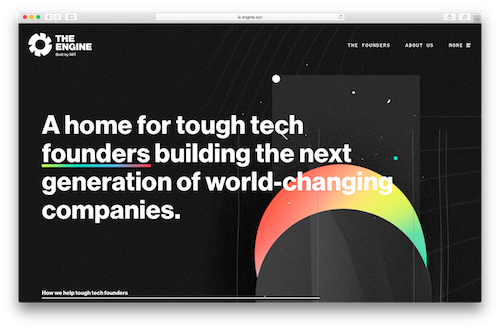 GrowthEngine.xyz set out with a mission to help make business’ dreams a reality and, like .xyz, they are fostering an environment where the bright minds of #GenXYZ can succeed and thrive.